So, Rachel and I decided we were going to write holiday posts. Hers is awesome. I failed at writing mine, even though I had it all planned out. I don’t hate the holidays or anything; I just wasn’t feeling inspired. Both Thanksgiving and Christmas snuck up on me this year. So, instead of reminiscing about Christmases past, and also because it’s New Year’s Eve, I’m going to reminisce about some of my favorite moments from this past year. I was going to put them in chronological order, but I’m feeling kind of lazy. Rachel and I started this blog. That was pretty cool. I got to celebrate the 1st anniversaries of the three couples whose weddings I was in last year. I didn’t actually see any members of these couples on their anniversaries, or even near their anniversaries, but I did have my own private celebrations. In a non-creepy way. I loved “True Blood” nights with M & E. We always had yummy air popped popcorn. I also loved “The Walking Dead” nights with my roommate, especially the season 3 mid-season finale where we screamed loudly, several times, and yelled a lot at the TV. Sorry, downstairs neighbors! Rachel and I (and Lincoln) went to our disaster of a high school reunion. Although it may not have been well attended, it was great to see those who were there and catch up with old friends. I also got super drunk and threw up in my parents’ bathroom sink. I’m awesome. At said reunion weekend, we got to see Alia and her husband. I think that may have been the one time the Trifecta was together all year. It was lovely. And we had creemees. Alia stuck her tongue in mine. We had a super fun road trip to get to the reunion. My fondest memory from the road trip was Rachel, Lincoln, and me all singing “Shut Up” by Blink 182 at the top of our lungs. Now I think about it every time I drive to Vermont. My good friend from work got married this fall. It was a beautiful wedding. Aside from seeing my friend walk down the aisle and celebrating the couple’s happiness, my favorite part of the wedding was when my tights, which ripped BEFORE I left my house but I wore them anyway, kept falling down and I had to take them off and throw them away in the bathroom at the reception. Luckily I had the forethought to bring boy shorts to put on under my dress. I figured going commando in a short dress at a wedding would not be classy. I got chased by a gopher in a cemetery. Long story. I got to go white water tubing with my roommate and friends for her birthday. It. Was. Awesome. Rachel, Lincoln, and I went to the circus to see our friend, The Ringmaster. It was super fun. The circus is amazeballs. I also won a painting done by an elephant. Score! My mom and I got matching pajamas for Christmas and we wore them all day. We looked adorable. My good friend from work and I had a fabulous time at our work holiday party. Going to a party from 3 pm to 5 pm on a Thursday in a huge room full of faculty and staff from a large University may not sound like fun, but it’s seriously the best day of the year. My friend and I played “How Much Wine Can You Drink In Ten Minutes” and we both won. It was a great night, for several reasons. Instead of the Holiday Party, I’m going to start calling it The Annual Shitshow. And, my most favorite memory from 2012 was when Miss Rachel called me from London with an announcement. I had just gotten on the bus on a Friday afternoon heading home from work when my phone rang. Rachel never calls (we communicate via text message, Facebook, email, and Snapchat exclusively), so I knew it was important. She was calling to tell me that she and Lincoln had gotten engaged and to ask me to be her maid of honor. I accepted immediately. And I cried. I’ll never forget that afternoon. So, there you have it. I had a pretty great 2012. Song of the Day: Take Your Time (Coming Home) by Fun. I am not a competitive person. I like to play games for the sake of playing a game (and having something to do). I don’t care if I win or lose. This lack of competitive edge is why I sucked so bad at field hockey. So, when I dove for the bouquet at Alia’s wedding, I think I shocked a lot of people, including myself. 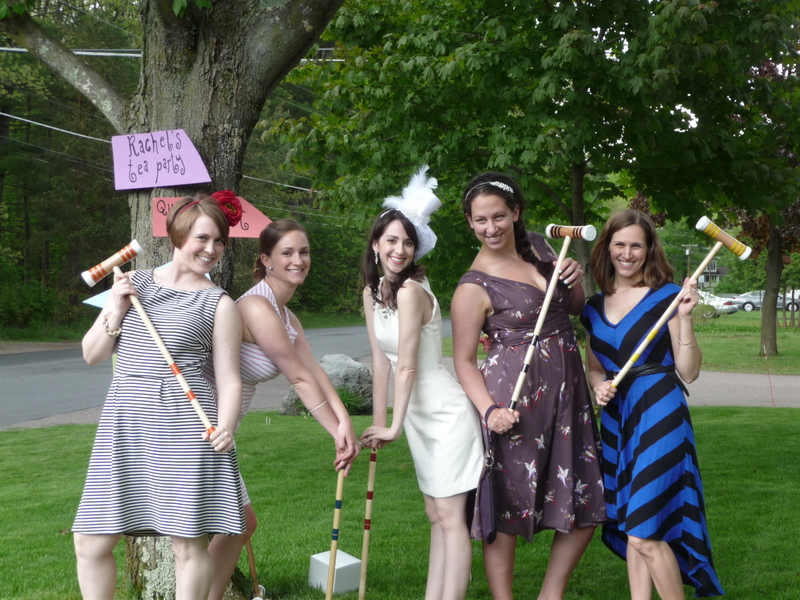 I was a bridesmaid in three weddings last fall. At the first wedding, I found myself really wanting to catch the bouquet for some reason. I placed myself in what I thought was a great place and jumped with the other hopeful bouquet-catchers as the bride tossed. Alas, I was standing too close to the bride and the girl standing behind me was the lucky one. It ended up being OK, though, because the guy who caught the garter wasn’t my type. Up next was Alia’s wedding and I was ready. I positioned myself farther back in the crowd and crouched into the perfect pouncing position. What I did not take into account was the low ceiling in the venue. The bouquet ricocheted off said ceiling and the girls in front of me dove for it- and I dove on top of them. This moment is really just a blur to me, but what I do remember happening is this: the girl who caught the bouquet started to run off the dance floor after she had the flowers. Unfortunately, my hand was caught in her hair and, as she started to run, I pulled my hand back. Hard. It must have hurt. I felt bad. Kind of. Then, Alia turned around and yelled at the bouquet winner, who I think was her cousin. I’m not sure why she yelled. Alia’s not sure why she yelled. It was all very chaotic. I then skulked off the dance floor to wallow in my loss. Rachel came over to tell me that she’d never seen me act so aggressively in my entire life. I told her how I’d pulled the girl’s hair. We shared an evil laugh. Then, bouquet girl came over and handed me the flowers. After some back and forth with her (“You take them.” “But you caught it!” “No, really, take them.” “No, they’re yours.” “No, here.” “Why?” “I don’t want them.”) I had the bouquet. I was victorious. And I was treated to a very risque, Chippendale-esque routine by Alia’s cousin (other side of the family from the girl who’d caught the bouquet) who had caught the garter. The garter that I later wore OVER MY JEANS to the wedding after party. God, I’m so cool. 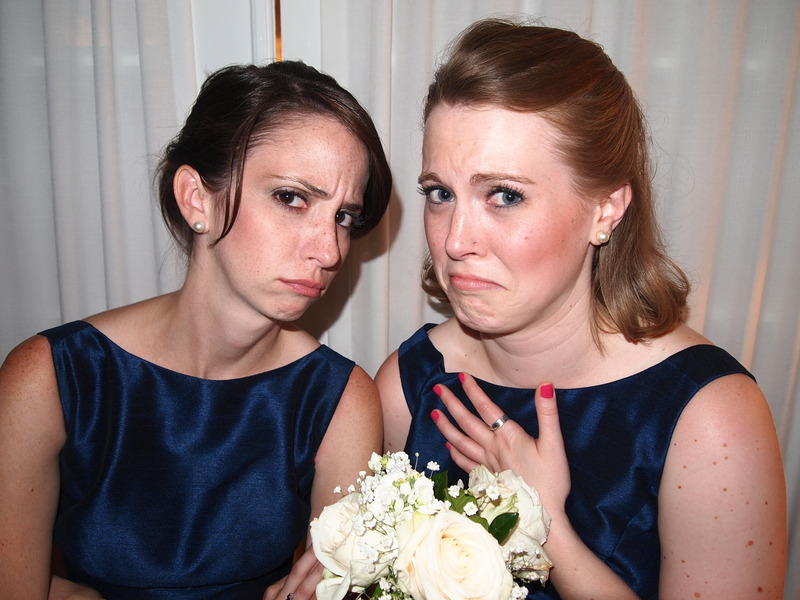 A lovely picture of Rachel and me with the infamous bouquet. The bride at the third wedding did not throw a bouquet, so this scene was not repeated. That is something we can all be thankful for. This incident has taught me that I do have a competitive spirit buried deep inside of me that only comes out when I’ve had wine. Also, I’m really awesome at weddings.